Well, it seems like eons since I last posted! This is due to my site being infiltrated by really mean French people who infected it with malware. Frankly, I don’t really understand it all, but my nephew was able to get it up and running infection free again. Life doesn’t seem to slow down a bit. Since my last post in May, I have gone to Farm Chicks, Hawaii and Whidbey Island…Miss G. has gotten a real job as a grocery checker at Safeway and likes to spend her free time memorizing PLU codes for fruits and vegetables…Mr. D finished baking all of his fundraising pies for his mission trip; we figured he ended up making 117 if you count the burnt ones and the ones his Dad needed to eat; he leaves this coming Thursday for Guatemala…. Coco has turned eight and we have been sucked into the world of select soccer, need I say more? And the Lieutenant keeps on going to work and making us all sweet tea to drink. 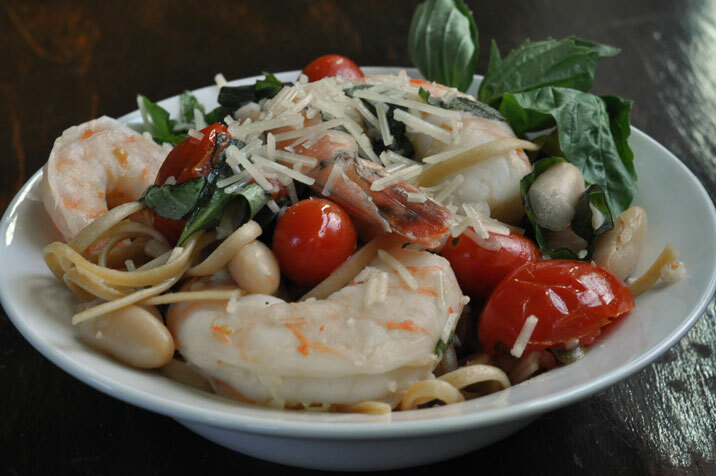 So, today I’m here to tell you about my friend Beth’s recipe which I have renamed Tuscan Shrimp with a Divine Ragoût de Haricots Blancs et des Tomates. I have to tell you, I don’t usually trust skinny cooks; and Beth is a skinny cook. You know they can’t be using enough butter, sugar, cream in their cooking when they remain so slim. The perfect body type for a good home cook is a solid size 16 in my oh-so-expert opinion. Your size 16 woman is making some darn good hearty food; size 2’s like Beth..they’re using the applesauce in place of the butter. Now, if you gave Giada de Laurentis red hair, bright, twinkly blue eyes and a Lutheran minister father you’d have Beth. And, frankly, I have come to the conclusion that Giada de Laurentis is just a front for a chubby, Italian grandma cooking away in Newark because Giada’s a size 2 and can’t really cook! I know I’m right. But, I have to say, Beth is an amazing cook who does prove my theory wrong; this recipe is evidence of that. I didn’t think white beans could taste so good. I live for shrimp, but the beans in this dish are to die for. Heat the broiler and preheat a large seasoned cast iron skillet on the top rack for 10 minutes. In a bowl, toss together tomatoes, beans, capers, garlic, 1 T. oil, 1/2 t. salt and 1/4 t. pepper. In another bowl, toss shrimp with 1 T. oil and 1/4 t. salt. Remove skillet from the oven and add the tomatoe mixture. Broil until the tomatoes just begin to wilt and char, not more than 5 minutes. Remove from oven and stir in the wine and stock and gently add the shrimp. Broil about 4 minutes, stirring halfway through, until shrimp are opaque. Remove from oven and sprinkle with parmesan and basil. Eat this immediately. It is really good over linguine. Yum! I like the cream idea! You do look like a size 2! this is totally a dish you would love! Miss you! So glad to have you back in my blog updates….I’ve missed my Joan! Ok this is on my make ASAP list! I have an abundance of basil that I’ve been growing and this looks like a perfect way to put it to use. I love every ingredient in this recipe and it’s all in one dish…..yummy! Oh my goodness – – your dish looks so much more beautiful than mine Joan! Ok, so I have to admit that I change this recipe every time I make it. The newest ingrediement (Pooh’ism) I’ve added is a very large splash of cream. Yup – – the full-on-fat kind of cream. THAT cream. My three favorite ingredients in anything savory – – dry white wine, cream, butter. We had porkchops last night for dinner and I made a lemon sauce with Meyer lemons, wine, and a generous splash of cream at the end. Heaven. You’re a brilliant writer as well as a brilliant chef Joan and I am so thankful your blog is up and running again. Thanks for lifting me up today – – and what fun to read that I’m a size two – – some thirty some years ago anyway. Hugs and summer love! I’m with you, I don’t trust a skinny cook. Kind of like I’m suspect of people who don’t drink wine or coffee. But Beth blows that theory out of the water. She’s one of the best cooks EVER next to you and my mom. My messy, unorganized 3-ring binder that I call my family recipe book is made up of 60% of my mom’s recipes, 20% of yours and 20% of Beth’s. Ethan asked me the other day if he could inherit that ratty old 3-ring binder. I thought my heart was going to leap out of my chest. Love that boy!! I’m trying this recipe out at the beach in August for sure!